I was reminded of this photograph the other night and wanted to post it here. 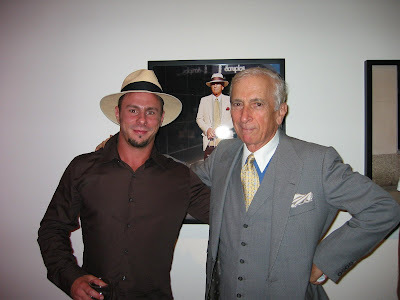 It is an image of me and author Gay Talese at the opening of The First ICP Triennial of Photography and Video in 2003. I had some images in the show from my series Madison Avenue Portraits and the image I shot of Mr. Talese was one that was selected for the show. I was really happy that he showed up for the opening and snagged his signature hat for this memorable photo. A funny side story is I was out hustling my work to photo editors around this same time and one of the editors I was showing this particular body of work saw the photo of Gay Talese and said "that's my dad." Indeed it was Catherine Talese photo editor and daughter of Gay Talese!